If you're looking for a show-stopping, impress-the-dinner-guests dessert, then look no further than this indulgent, creamy and 100% plant-based creation. It features 2 layers of coconut ice-cream (double chocolate + salted caramel - seriously yum! ), candied almonds, turkish delight, and is all enclosed in a blowtorch-baked aquafaba meringue. 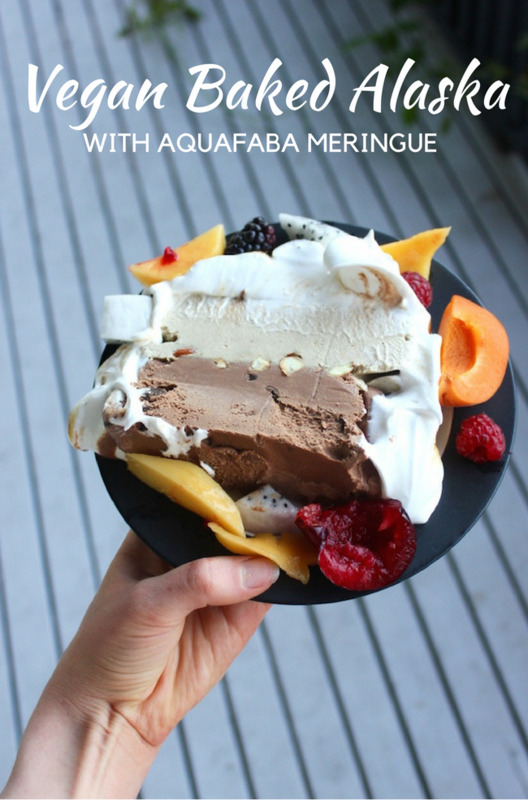 What exactly is aquafaba meringue, you may ask? It is a meringue made by whipping chickpea brine (you know, the liquid in a tin of chickpeas). Yep, it turns out that you don't need egg whites! Aquafaba meringue can be used to make anything a traditional egg-white meringue can, including meringue kisses, pavlovas, macarons and lemon meringue tarts. The whipped mixture also makes a fantastic 3-ingredient vegan chocolate mousse (just whip chickpea brine, and then add melted dark chocolate & a little maple syrup if desired). You can also use the mixture to make vegan butter, mayonnaise, cheese, ice-cream, marshmallows, pancakes and to brush pastry. It really is incredible. If you're looking for ideas, this facebook group is a great resource. But anyway, back to this Baked Alaska.. So admittedly, this first attempt wasn't perfect looks-wise. The meringue layer was thrown on pretty quickly and it wasn't completely even on all sides, but, it didn't matter because it still tasted incredible. Next time we try it though, we'll pipe it into more artistic swirly peaks. It would look quite pretty done as mini, cylindrical versions too. One of the great things about using a plant-based meringue in this recipe is that you don't need to fuss about it being completely cooked through. (Which means you can skip baking it in the oven, and just blow-torch bake the whole lot instead). While a Baked Alaska mostly features layers of cake at the base, we prefer this version without. But if you like it with cake, simply add slices of your favourite cake to the very top layer, which will become the bottom layer when the ice cream log is flipped out. And of course, you could use this same method with store-bought vegan ice cream & home made aquafaba meringue, if you are in a hurry. Cover cashews with cold water & soak for 1 hour. Meanwhile, cover dates with boiling water & soak for 1 hour. Drain dates & transfer to a high speed blender or food processor. Add plant milk, & blend until creamy, add drained cashews & whiz again until very smooth. Add all other ingredients & blend until smooth. Line a small loaf tin with baking paper (to make it easier to retrieve the slice when frozen) and pour caramel mixture into tin. Place in freezer to set while you make the Double Chocolate Ice Cream layer, and the Candied Almond layer. Place whole almonds in heavy bottom pan and toast until golden. Remove and arrange on a tray lined with baking paper and set aside. Place sugar and water in small heavy bottom pan & stir gently over low heat, until sugar is dissolved. Turn up heat to boiling and boil (without stirring) until it turns a deep caramel colour. Immediately pour caramel over the almonds, drizzling as much over each nut as possible - working quickly as the caramel will set fast. Set aside to cool, then roughly chop into chunks. Scatter candied almond chunks & chopped Turkish Delight chunks on top of frozen date caramel layer and return to the freezer while you finish the Double Chocolate Ice Cream layer. * Here in Melbourne, we're lucky to be able to buy vegan Turkish Delight from Oasis Foods, who make it freshly using cornflour as the thickener rather than gelatine. If you can't find vegan Turkish delight, simply skip this ingredient as the Baked Alaska will taste amazing anyway. Cover dates with boiling water & soak for 1 hour. Drain & place in high speed blender with all remaining ingredients except choc chips. Blend until smooth. Taste & add maple syrup if you like it sweeter. Gently stir in choc chips. Pour the mixture into a large zip-lock plastic bag, and place flat in freezer for about 2 hours or until just firm. Working quickly, bend the now-frozen slab into chunks while still in the plastic bag & place the chunks in food processor in small batches. (We did 3 batches.) Blend till creamy-smooth, and using a spatula, layer on top of Turkish Delight & Candied Almonds, which are on top of frozen Date Caramel Ice Cream. Return the whole tin to the freezer for at least a couple of hours to set. * In Australia, sugar is vegan, as bone char is not used to filter. We make our own icing sugar by milling raw sugar in a high speed blender until it forms a fine powder, but you can use store bought icing sugar instead. Place chickpea liquid (or Aquafaba) & citric acid into bowl of kitchen mixer with a whisk attachment. Whisk on high speed until it becomes fluffy and white. Remove the tin from freezer & pull the paper to release the ice cream and invert onto a large plate. Remove paper. Pipe or swirl the meringue all over the top and sides of the ice cream, making sure to cover all the ice cream to protect it from the heat of the blow torch. Using a blow torch, caramelise the aquafaba meringue as much or as little as you like, focussing on colouring the peaks & swirls to create a contrast. Either serve straight away, or return to the freezer until you are ready to serve. We served ours with a summer fruit salad of cherries & peaches, but really what fruit wouldn't taste good with a Baked Alaska? And if there are any leftovers, (probably unlikely) it keeps well in the freezer, in a covered container, for about a week.